Families in Fareham will be joined by an Olympic gold medallist to celebrate the official opening of the brand new Holly Hill Leisure Centre. 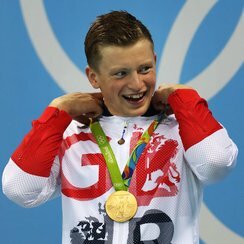 Everyone Active and Fareham Borough Council have asked Team GB swim star and Olympic gold medallist, Adam Peaty, to officially open the new state-of-the-art Holly Hill Leisure Centre as part of a celebratory event on Monday 10th October 2016. Adam found glory after winning Team GB's first medal of Rio 2016 when he took gold in the men's 100m breaststroke with a world record. The already world, European and Commonwealth champion, finished more than 1.5 seconds clear of his nearest rival in the competition. Adam will officially open the doors to the new-look centre with a ribbon cutting ceremony and the unveiling of a commemorative plaque alongside The Mayor of Fareham, Councillor Mrs Connie Hockley. Once the centre is opened to the public from 3pm, Adam will make a splash in its brand new pool, by offering guidance for children taking part in the afternoon's swimming lessons. Later on, visitors to the centre will be given the once-in-a-lifetime opportunity to take part in a Q&A with the star and get his autograph. He will also be announcing the winner of a prize draw where more than £3,500 worth of family activities are up for grabs. The centre's afternoon activities will include an open swim session for the general public in the main pool between 3pm and 4:30pm. Children booked onto the centre's ASA awarded swim lessons will carry out their sessions between 3:30pm and 6:30pm and will be accompanied by Adam Peaty in the pool between 3:30pm and 4:15pm. In addition, other children's activities will be available throughout the day, including face painting and balloon modelling. Group exercise taster sessions will also be available for adults to try out. The full itinerary for the day's public events is listed below. Fareham Borough Council has invested over £9million into the brand new Holly Hill Leisure Centre, to provide an extensive range of facilities for local people. 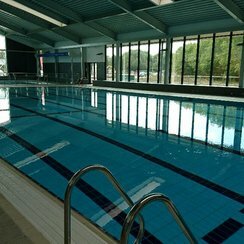 The building features a 25m pool with six lanes, a learner pool, a fully-equipped gym, an exercise room, a group cycling studio and a dance studio. Executive Member for Leisure and Community, Cllr Sue Bell, said: "This new leisure centre has been long awaited by residents that live in this area and I'm very excited for everyone to see it. It's such an impressive building; there really is something for all of the family at the centre."